March 15, 2019 — UPDATE — A few months back, Spring and Google Voice stopped playing nicely together. I started to notice that my calls weren’t properly going to Google voicemail, and other issues. While investigating, I could not find quality information, especially on the Sprint website. There’s limited documentation about call forwarding (*72, *73 and *74) but there was never before much in the way of describing the differences. (It should be pointed out that I don’t use my Sprint number. I don’t share it. And I don’t want to use Sprint voicemail services.) I only give out my GV number (which forwards to my Sprint number) and I only want to receive voicemail in my Google Voice inbox. For a few weeks I have noticed that the *73 function would NOT send calls to Google voicemail if I manually declined (swiped away) a call. It would only work if I just let the call ring. If I manually decline a call, it would go to Sprint voicemail. That’s not good! I called Sprint. The nice lady at Sprint was knowledgeable, but she and a colleague BOTH said it was no longer possible for a call to go to Google Voicemail if I manually declined a call. Now, if you call my Google Voice number and I manually decline OR if I let it ring, you will get my Google Voicemail. Mission Accomplished! I honestly don’t know if my *73 and *74 are both turned on simultaneously. I don’t know if one supersedes the other. I don’t know if my turning ON 74 then turned off 73. Sprint could not answer that question. I can only assume that at this moment in time I have both 73 and 74 turned on. So for now, I am going to follow my three steps above to set up Sprint call forwarding to Google Voice mail. If you want to feel my struggle, you can read the following old article that I wrote quite a few years ago. 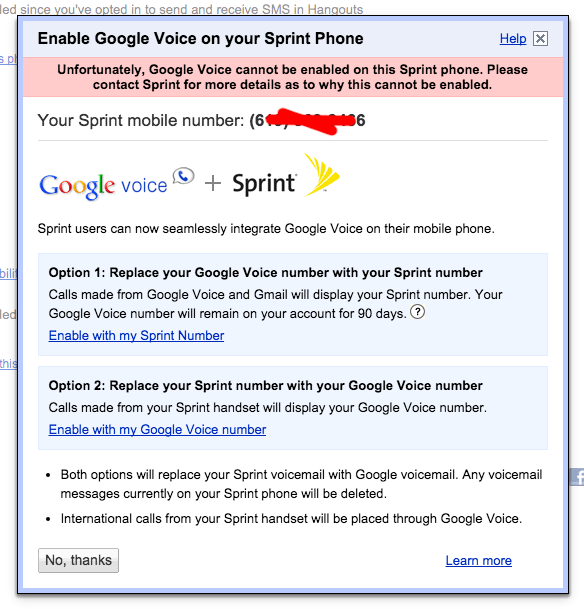 2016 — NUTSHELL: In order to have Google Voice take care of your voicemail instead of Sprint, you need to add a *73 Conditional Call Forwarding code to your Sprint account… so that your busy / no answer calls at Sprint are forwarded to your Google Voice number, where Google will take care of your voicemail, and leave Sprint out of it! It’s so simple. Just use your phone app and make an outbound call (from your Sprint number) and dial *73XXXXXXXXXX (where X is your 10-digit Google Voice number). It will be silent for just a second and then you will hear a beep and it will hang up on you. You’re done. Now calls that you don’t answer will go to Google Voice for voicemail! Have Sprint? Use Google Voice? Having configuration problems? If so, this article is for you. Google Voice has treated me well for the past few years. I love the features it offers, and all for free. I appreciate that calls made to my GV number are auto forwarded to my cell. That’s perfect for when I am in the field and out of the office. My mobile phone plan is on the Sprint network. The system and configuration worked well until last week when I changed my mobile plan. I’m still on the same phone, with the same number, and still on Sprint… we just changed the data package / plan. After the plan change, the GV configuration with Sprint was no longer working. If you called my cell and I sent you to voicemail, you’d hear a Sprint voicemail system greeting. That’s not what I want. I want you to hear my GV voicemail greeting. If you called my GV number, you’d be auto-forwarded to my cell (that part still worked) and if I clicked “dismiss” on my cell because I could not talk with you, you’d be sent to the Sprint voicemail system greeting. Again, not what I wanted. So, I deleted the GV app and re-installed a number of times, trying to fix the problem. I deleted Google Hangouts app. I removed my cell as a forwarding number from Google Voice desktop so that it was no longer a forwarding recipient of calls made to my GV number. I did everything I could to disconnect Google Voice from Sprint and vice versa… simply trying to start fresh… as if I was a brand new user. Frustrating. The *28 and *38 codes are calls that you make from your cell TO Sprint… so for them to not work, it’s something wrong on Sprint’s computer system and in my account. To me, it’s clear as day, but to many of the Sprint reps, the problem is with Google. Clearly, Google tried and Sprint blocked it. Google wants nothing more than to provide my voicemail services and snoop into my life for advertising… which is fine with me… but the point is that they would not have an interest in blocking the service. Seeing these error messages a number of times, no matter what I did to start clean, start fresh, I could not get anywhere. I spent the good part of a day on the phone with multiple Sprint reps. I talked with them. I chatted with them directly on Facebook private messages. I chatted with them on their website chat system. Nobody could help me. And I got different answers from different people. And nobody really had much experience with Google Voice. That was really frustrating to hear, because it’s a stupid answer / reason / thing to say. No matter how many Sprint people I spoke with and no matter how many times I mentioned the error messages, and that the Sprint system was not letting me enter the conditional call forwarding code *28, they did not know what to do. The next day, I reached out again to Sprint via facebook chat. A rep named Janice called me. She listened patiently to my explanation of how things are supposed to work, and that the system was blocking me from setting CCF codes. So she MANUALLY added the *28 CFF code to my account, forwarding busy / no answer calls to Google, and now it works again! Halleluia! Google and Sprint both acknowledge that Google Voice will not work on Sprint lines that have certain issues, mostly financial, like “You haven’t paid your bill” or “Your account is on hold” type of scenarios. But there’s no reason for it not to work this week when it worked last week, when I’m on the same device, same number, same network, etc. The only change was my sprint mobile plan — which somehow deleted the *28 Conditional Call Forwarding code from my account, and blocked ME from adding it back to my account. I want one voicemail service, not two. I want to control which greeting a person hears when they call. Google Voice let’s mom hear one message, while clients hear another. I want my voicemail messages transcribed into text then emailed to me for convenience, archiving, and searching. I want all of my voices messages to appear in Google Hangouts. This convenience allows me to quickly read the message, and in most cases, quickly type a text back to them, from any device. Thanks to Janice at Sprint for fixing what others couldn’t!